More good news now as Y.CO tell me they found a buyer for the 28.55m sailing yacht Kim, a central listing with Jukka Kaukonen at KK Superyachts. 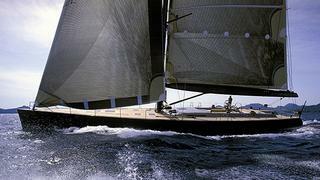 Kim was built by Wally Yachts in 2003 to a German Frers design as a fast cruising sloop. This superyacht has been continually upgraded over the years and successfully integrates the performance of a maxi racer with the characteristics of an ocean cruiser, easily and safely sailed in the rough waters of the North Atlantic. Accommodation is for six guests and three crew, while a 250hp Cummins engine delivers a cruising speed under power of 12 knots. Kim was asking €4.9 million.